If I follow someone, will it automatically show on their sidebar and on my profile page ?? Is there a difference between being a Follower and stating that someone is one of your favourite blogs ?or on your blog list, If I am someone's blog list does that mean that mean that they are a follower, and if so, why are they not on my follower sidebar.? How do I un-follow someone? That sounds a bit unkind, but isn't. When I first started blogging I chose someone to follow that I later realised hadn't blogged for a couple of years, so is unlikely to be carrying on with their blog. I bet you all think I'm thick now don't you ? but there just seem so many anomalies. 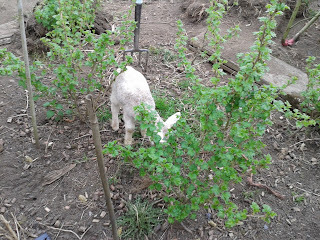 On a more serious note, yesterday Simon, one of the lambs died. He had been getting weaker for some days now, and though he was drinking his bottle he was not grazing or bouncing around like he should be. We had given all the lambs antibiotics and wormer as they were not strong, clean lambs like we are used to and we are not really happy with any of them. So now we are watching the others closely and keeping them on extra bottles. Wish us and them luck ! 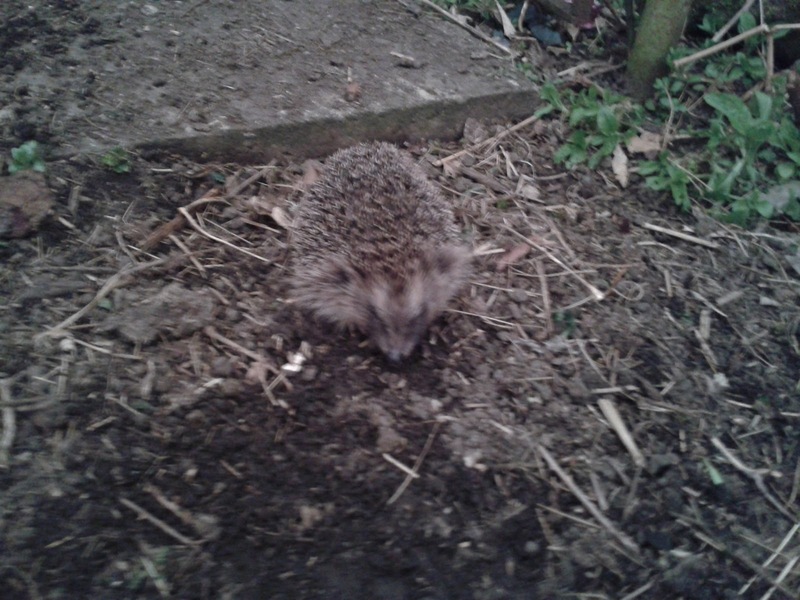 Off to help Adam ( one of our shared lives guys)get some supper and ready for bed now. Still can't find my Challenge notes so have cobbled together a final resume. In the final 5 days I used up one slice of the frozen bacon into a savoury roll. I made some stuffing from the bread crusts and a roll ( with onion and herbs). I put a "patties-worth" aside and cooked another slab in a little oil when I cooked 2 jacket potatoes in the oven. While the oven was I also put a small rice pudding ,made with long grain rice that I had boiled up before in the microwave first. ( If i had a smaller oven it would have been more cost effective). That night I had a jacket potato, with an egg and coleslaw. So, back to the savoury roll. I cut the bacon, the other potato and the cooked stuffing into cubes, and made a sort of sauce with stock cube and flour. and mixed all this together for the filling. This made 2 good sized dinners. One day I had it with sautéed cabbage and the next with baked beans. On the penultimate day of my challenge I cooked up the last of the rice in one pan and lentils, chopped carrot and chopped onion in another. I blitzed most of the lentils, carrot and onion and with the addition of a a stock cube made two days worth of soup. The remainder I added to the rice with some seasoning, the last stock cube and chopped ransoms and made a sort of risotto for my evening meal. The last slice of bacon I had with an egg, the last of the beans and the last rather dry slice of bread, fried. Finished with a fry-up !!! I spent £20-40 on the first day and a further £3 ( eggs, half a bag of sugar and the veg from Cornwall). Non of my drinks ( cups of tea!! )were included in this. Just switched on the TV and apparently the Great and the Good (well famous people anyway!) are doing a 5 day pound a day challenge. My timing always has been C***, I should have started it today !! 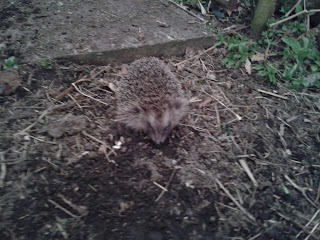 Au Revoir Prickly Pete, My Bibles and Planting with lambs. 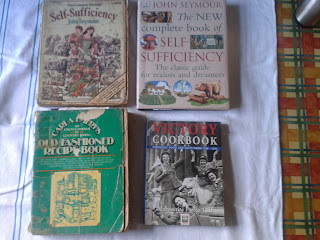 The books below are my "Bibles" The top two are the same book nearly 40 years apart. The old one was falling apart, so I bought a new one last year, but can't bring myself to get rid of the old one, it's an old friend. 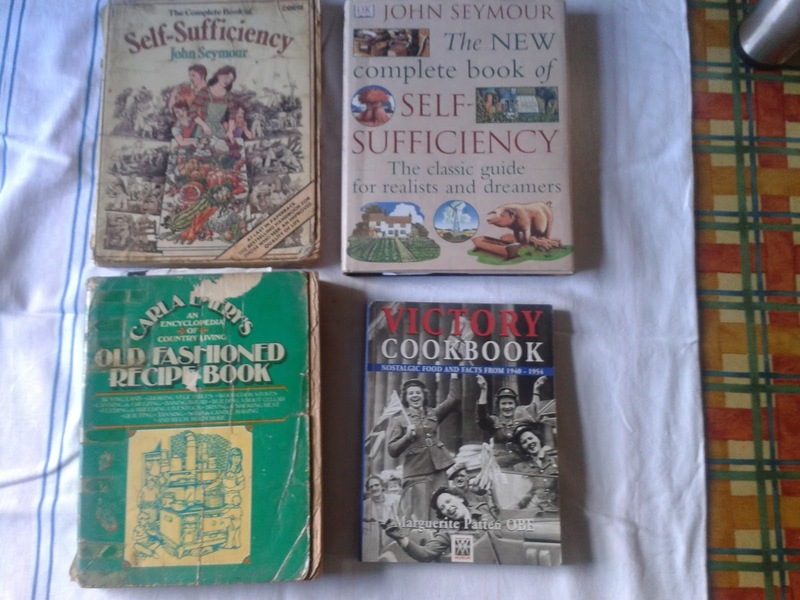 I notice that Chelmarshchunterings and Frugal in Suffolk are reviewing their books too and there are a couple of books that I really need to look at. 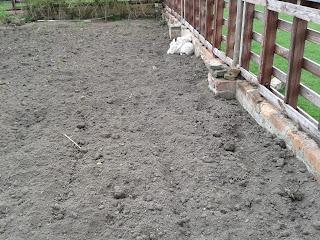 My next Pic is of the lambs doggedly watching as I plant Brussels, they really believe that this is THEIR garden. Note that the fence is made of pallets ( of course!) This is their last time in this garden for obvious reasons. As the ground was rotivated recently, it was too loose for Brussel plants ( if you want tight "knobs" the ground must be firm ) so I trod up and down where I was planting, to firm the earth.Note the plastic collars at the base of the Brussel plants and the netting over willow hoops. We grow organically, and the collars deter cabbage root fly, while the netting keeps the cabbage white butterfly away. Here is the completed row. 12 plants, 2ft apart 2ft between rows. 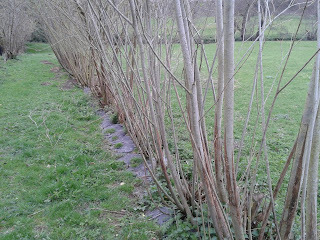 Here is a picture of my stand of willow. I use this for the hoops and for other garden structures. We also let some grow thicker and use this for fuel for the fire. Have to go now as folk are arriving for lunch. This weekend should have been my birthday as I received the very best present !! ... My Godson rotivated two of my veg plots!! The first picture shows him rotivating the "paddock garden". 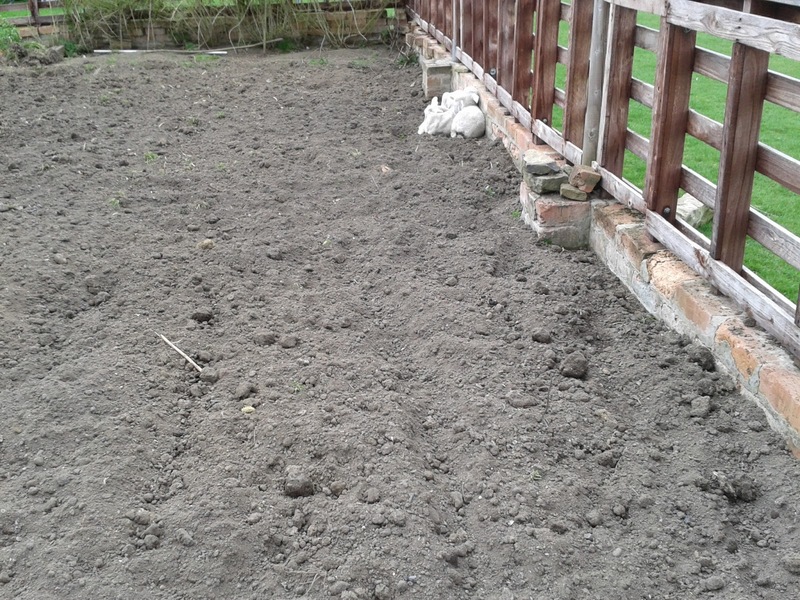 this year we will grow brassicas in this plot. Note to the side there is a stand of raspberries, half are red and half yellow. In the foreground is a Goji Berry hedge and just off picture,bottom right are 7 "Invicta" gooseberry bushes. Unsurprisingly it got it's name from the fact that it is bordered on three sides by our paddock, the fourth side butting up to the orchard. After GdS had finished the paddock garden the lambs found their way in, which WON'T happen once I have planted, and settled down for a siesta. 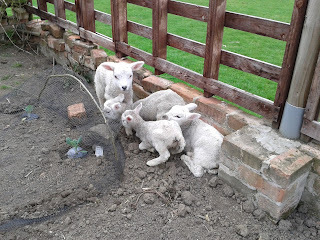 If the pic was of a better quality you might be able to pick out that there are only three lambs snuggled up. So who is missing? Sky, the weakest, smallest lamb is not with the others. We have been worried about her as she has not been finishing her bottle, though her tummy seems full, Well here is why !.. Sky scrumping gooseberry leaves and paying particular attention to the little flowers and generally filling her face !! I have decided to itemise the abbreviations I am using for my family. See right side bar. Hopefully this will make some posts easier to follow. I still can't find my final frugal challenge notes, so if I haven't found them by the weekend I will try to remember what I did and spent ! I don't know about you, but I've really been enjoying reading people's 30 ways to save money. There is always something to learn. After tea tonight I MUST sit down at the old laptop and get the Civic Society Newsletter written It must be ready for circulation by Wednesday. So, nose to the grindstone ! Welcome Dreamer. It's good to meet you ! Just a Quickie ..off to Cornwall again. 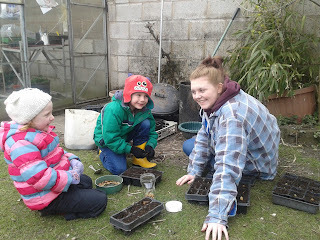 Yet again, youngest daughter steps into the breach to look after the smallholding. What would we do without her?! The lambs are getting stronger gradually. Lambs, Child labour, end of The Challenge, and other stuff. 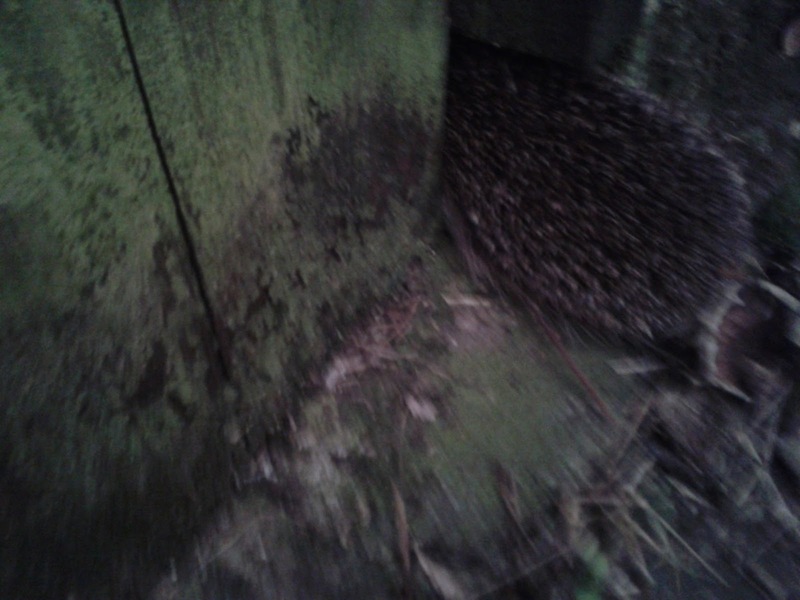 Back to my Blog at last ! Been a frantic few days, but I'm back in harness now and will bring you up to date with a few thnigs. The lambs - they are getting stronger little by little, though Simon has a bit of a limp at the moment, he's the weakest with long legs that he struggles to control at times ! Sky who is the smallest, is now holding her own with the others. Shaun who is the biggest, is still a bit picky with his bottle, but is eating hay readily, while Susie is the strongest, "bolshyist", greediest and (don't tell the others) prettiest of the four. It is warm today (remember warm?) so they can spend the afternoon in the field. When I was in Cornwall last weekend I went round my favourite charity shops. My best buy was an M&S blouse from the £1.00 rail and these curtains from the same rail. They measure 7ft by 4ft and will be part of my next project. 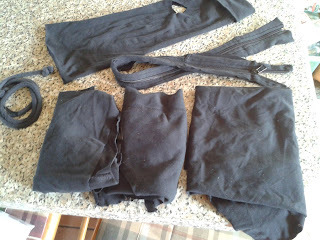 When I looked them over properly I realised that they had new detachable black-out linings too. Now that's what I call a bargain for £2 ! It has been warm and SUNNY today! The problem with sun is that it shows how disgusting my windows are!! So this morning I set to to clean the kitchen windows, that is, three windows and three glass panelled doors. I found that I had no window cleaner so I did what I should have done years ago and researched how I might make my own cleaner. God bless Frugal Bloggers ! So I set to with white vinegar and hot water, a soft rag (tea shirt) and some old newspaper. RESULT !! The windows look brilliant, literally!. One slight hiccup was that while I was teetering on a stool reaching the top of one window I reached down for a another sheet of newspaper to polish off. 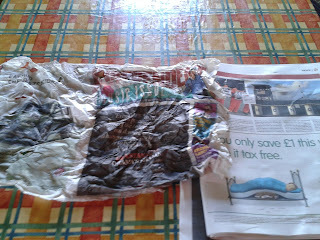 Job done, I stepped back to admire my work and glanced down at the crumpled, wet, front page of today's newspaper !! I had read that when I got in from the morning feed, but D. hadn't so much as glanced at it yet, so, (after taking a pic of it) I sheepishly (while suppressing my giggles ) presented him with his Sunday morning read. The Challenge is ended.. hurrah ! can't say that I am sorry. It is clear that living on a £1 a day long term is achievable, though I found it a tad boring and would certainly approach it differently if I did it again. Firstly I would batch cook more to help me through the boring days and I would also shop a little more as I went along, looking out for bargains and orange stickers and making something from whatever was available. I think that as a smallholder I had begun to forget just how much food we grow and preserve. I had to stop myself from dipping into the freezer or pantry to add some interest/vitamins/greens. We have always had a couple of meat-free days a week, both for health and economy. When living on a £1 a day meat is a luxury, apart from the "cooking" bacon from Sainsburys/Lidl. I must say I missed my lamb and fish! I have lost my list of meals at the mo. It is somewhere under the mountain of paperwork on my table. I will post it later , as I want to get this blog out tonight and we are going out to friend's in an half hour. My next pic is of eldest granddaughter and a couple of young friends planting seeds for me. (what's wrong with child labour?!) the first picture shows broad bean planting and the second illustrates how I always grow peas. 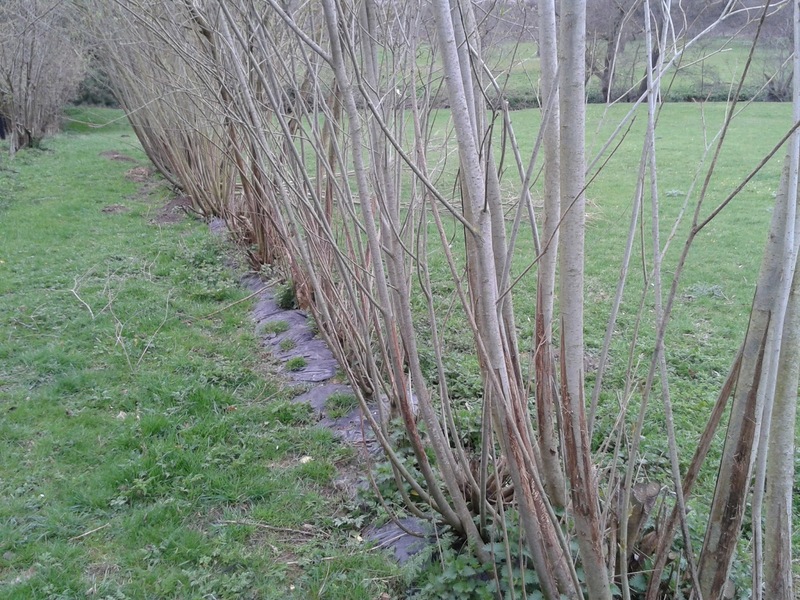 As mentioned in another post, I grow them in guttering, with gaffer tape at the ends and when the plants are a couple of inches high I slide the whole line out, undisturbed, into a trench of the appropriate depth. I grow them this way as it foils the mice that live in our drystone walls. We now have four broody hens (I'm afraid Mavis our first hen to go broody went off the idea as she was so harassed by the other hens. So we await the patter of tiny claws. Grrrr that D**n Fox !! Just a few lines to vent off about the horrid fox !!! Took three of my girls last night. 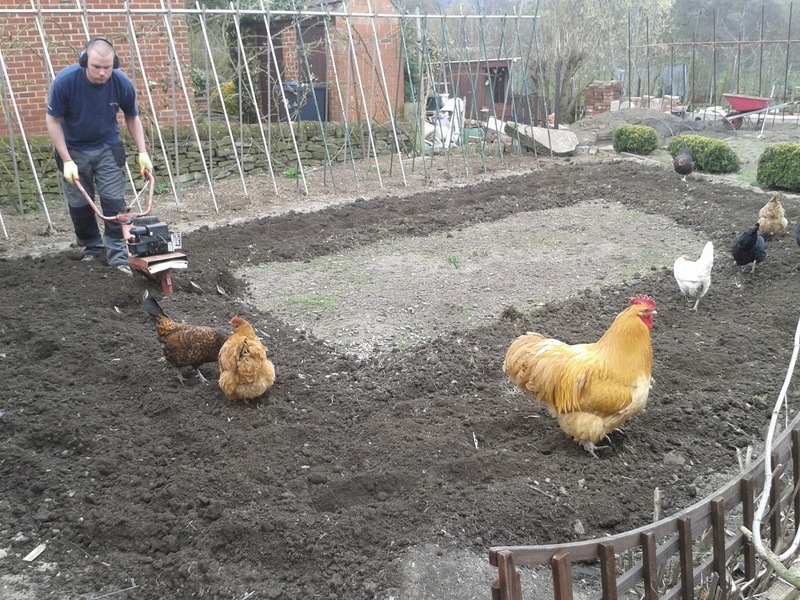 A black maran, a buff Orpington and our favourelle called Fi Fi. The rest have been very subdued all day, as have I. A positive side to my day was when I spent an hour and a half interviewing a woman and her husband (both in their nineties) about her memories. These "oral histories" are towards a book that two other women and myself from our Civic Society are to publish later in the year. . This couple were so lively and chatty and kept checking things out with each other and laughing at their shared memories. What lovely people ! Back to my quilting and an early night methinks as I didn't sleep well last night after finding the poor hens. I gave up at 4 o'clock and made myself some hot milk and then had a fitful couple of hours before getting up to do the first bottles (lambs) of the day. I promise to be in a better frame of mind tomorrow! Hello Again .. remember me ?! Back from Cornwall and into the swing of things here on the smallholding. Better do a quick update on the Challenge. I realise that the last update was last friday , but that I hadn't itemised the meals from the monday before, so I will bring you up to this LAST WEEK of the challenge. Tuesday - porridge; egg cob; lentil burgers and rice for evening meal. Wednesday - porridge; egg cob ( I mash the egg with salad cream, which is tasty and negates the need for butter) cheese and onion pancakes with pasta, with shredded ransoms from the river bank. Thursday - porridge, lentil soup (from new batch made yesterday) Out for a meal at a friends , but would have had the last portion of sausage and bacon casserole. Saturday - meals with friends all day. Will adapt the supplies at end of challenge to cover for this. While in Corwall bought a nice green cabbage, some potatoes, a couple of carrots and 2 large onions. = £1.50- this will need to be added to the cost of an extra 6 eggs and a half bag of sugar at the end of the Challenge..
Sunday - porridge; toast; sausage and mash with cabbage. Monday porridge; lentil soup; bubble and squeak and an egg. Today - no breakfast, not hungry; it will be beans on toast for lunch (along with our friends who will be here and have either cheesy beans or egg) and tonight I have savoury rice ( rice, a little onion, ransoms, finely shredded cabbage) and the last 2 sausages. PHEW !! thank goodness that's up to date! On count down to the end now. The Lambs have started to improve and have finished their injections. They are still under heat as it remains bitterly cold here. YD and I had them out in the field on sunday as there was some sun, but they are now back in the barn. I took some pics of them in the field surrounded by chickens, but didn't realise that the lens was smeared, so they look as though we have them out in the fog! Similarly I took pictures of the fish catch and what I did with it, so have no pictures of that either! Sorry about this as a picture is so much more attractive than my burblings!. In brief, D's catch wasn't as large as his last catch, but useful non the less. he bought back two ling, weighing 5lb and 5.5lb and a 2lb pollack. From this catch I made two generous fillets of pollack, which I have frozen skinned and ready to poach or fry. From the ling I made 30 breaded cougons and 6 large fishcakes - cooked the scrappy ends in milk in the microwave and added to mashed potato left over from YD's meal the night before. There was even a little fresh parsley in the garden for these. 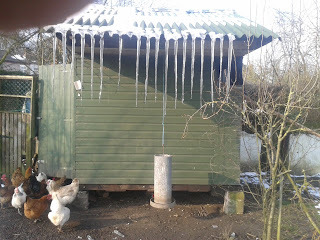 As usual all the heads, skins etc were cooked in a little water and given to the chickens for a treat. It is still a little cold to sew or plant much outside , so I continue to plant in trays and containers. 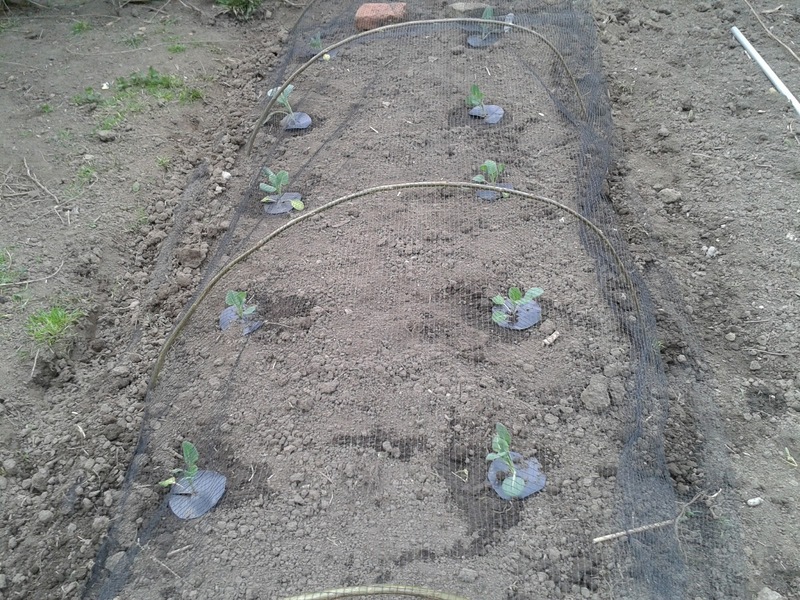 Over the last couple of days I have sown peas in short lengths of guttering. 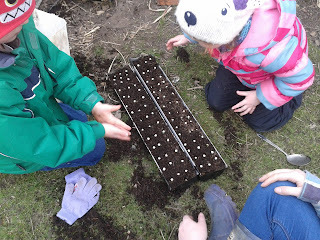 ( I seal the ends of the guttering with gaffer tape) In trays I have sown cabbage, broccolli, celery, more broad beans, celeriac and more parsnips. Yesterday I pricked out the maincrop onion seed into larger pots and some early tomato seedlings. I sowed more tomatoes under heat. I stagger the growing of the tomatoes to ensure a longer cropping season. we grow a lot of different tomatoes in our main (34 foot) greenhouse, trying one new type each year. 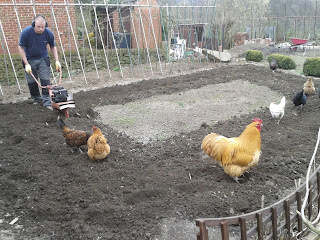 Yesterday D. progressed with the new chicken run, which meant that I was the labourer, which means sand, gravel and cement measurer and mixer ( he knows how to treat a woman!) 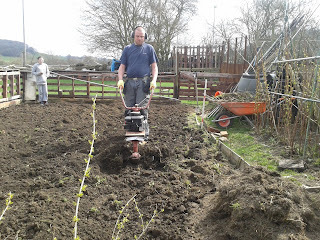 We are racing to get it finished before planting as the Buffs need to be housed separate to the others (because of a breeding programme) who are in the orchard, and away from the veg plots. 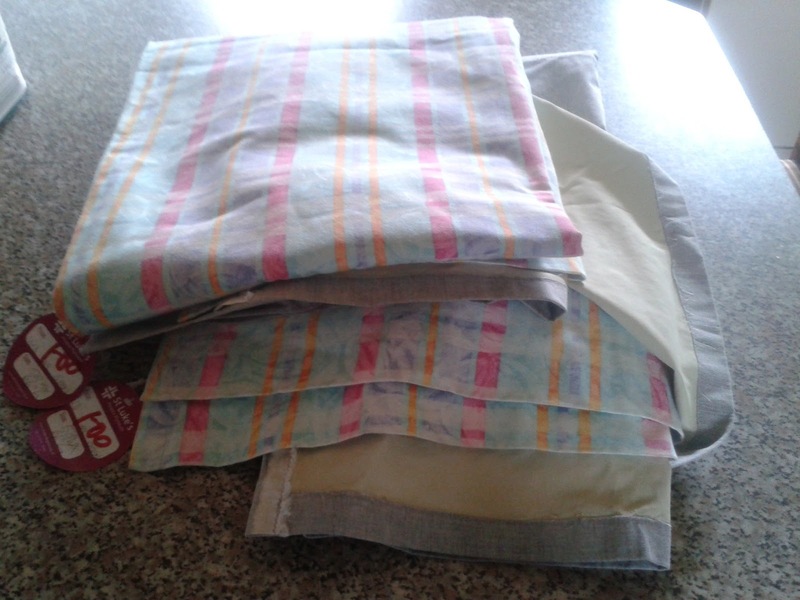 I have done little sewing over the last few days and unlikely to be doing any either by the look of things. The shared lives guys and our friends will be here for the day soon, then we have a civic society committee meeting early evening, before meeting friends at the pub later. So off the get lunch ready and make up some more bottle for the lambs. Sorry about the Pics and hope all this wordage hasn't been too boring. I've been extremely busy over the last couple of days and am about to set off for Cornwall for a spot of sea fishing (D. not me, I'll be gossiping with my friend) until Sunday. Which means that I am being neglectful of my blog. Sorry !! Update on the lambs is not as good as I would like it to be. They are still weakish and not drinking too well. Three of them are scouring still, so I have fetched some medication from the vet and hope that will help them hold on. This means that my youngest daughter who, bless her, takes over from us when we go away, has to give the little mites their injections, as well as five bottles a day and all the other care they need. Add this to looking after 40 plus hens, 6 pregnant rabbits, a cat and a parrot and you can appreciate just what she does for us. Oh yes! and her latest foster dog is to be spayed today before placement in a forever home, so YD will be nursing her too! The Challenge is going well. We went out for a meal at a friends last night, so I put aside a meal that I would have eaten so that I stayed on track theoretically ! Challenge and Sky the hoodie lamb. After a frantic few days I finally have time to myself to jot down a few thoughts and updates. The challenge continues, but I am loathe to bore you with it as I'm beginning to find it a tad uninteresting so I am sure you must too ! BUT. here goes. Saturday's meals - Porridge; last portion of Lentil Soup; Pasta with chopped bacon and the second half of the tinned tomatoes with garlic and chilli. Sunday - well fell off the wagon Sunday as it was Easter day and the family were round and I cooked a leg of our own lamb. So.. leg of lamb or lentil Dahl and rice ?? D**n right.. lamb it was! I actually didn't have any breakfast and had boiled egg in an egg cup with soldiers for lunch. I took the loaf I had made out of the freezer for the soldiers and will need to use the loaf up over the next day or two as it won't keep. Youngest granddaughter stayed the night and I had saved some batter mix from yesterdays yorkshire puddings. So for breakfast we had pancakes.. and why not?! I had beans on toast for lunch and tonight D and I had a plate meal each from yesterday's leftovers. I don't think I am doing too badly with the challenge. If I did it again I would do even more batch baking/cooking, . it is definitely more economical; and less tedious than thinking micro, when I usually think macro, what with the family, shared lives guys and our dear friends. 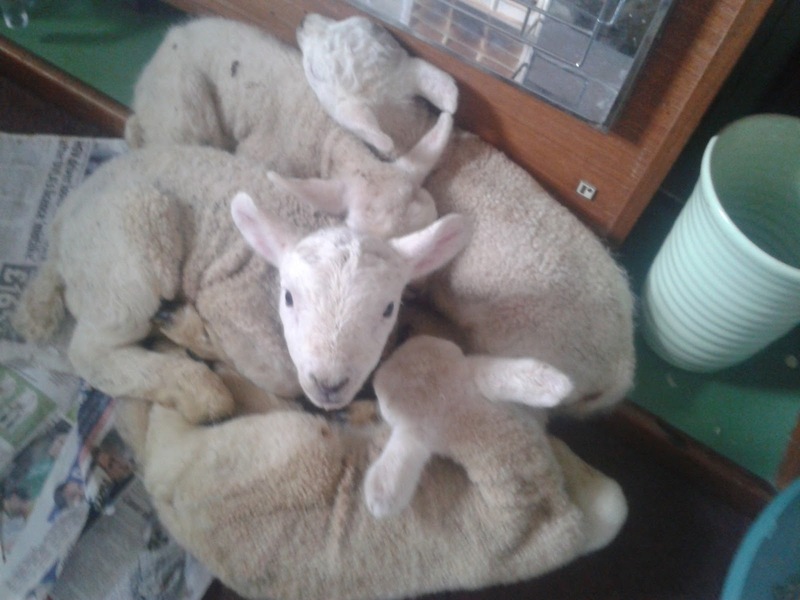 The four lambs that I fetched on Thursday night are back in the small lounge again tonight for a quick "warm up" They are not really thriving and I am quite concerned about them. they don't seem too strong and the temperatures are so low. we have a heat lamp on in the barn, but it still isn't really keeping them warm enough. the smallest, Sky, is VERY tiny and so today I cut up an old hoodie that was covered in paint splashes. Not one to waste waste even, apart from the two coats made from the sleeves, I have saved a perfectly good zip, a nice piece of chord and three floor/polishing cloths too. below is a picture of these items apart from the sleeve Sky is wearing. D. says " You are not seriously going to take a photo of those are you !?" and why not? The next picture is of the main hen house which is in the orchard. 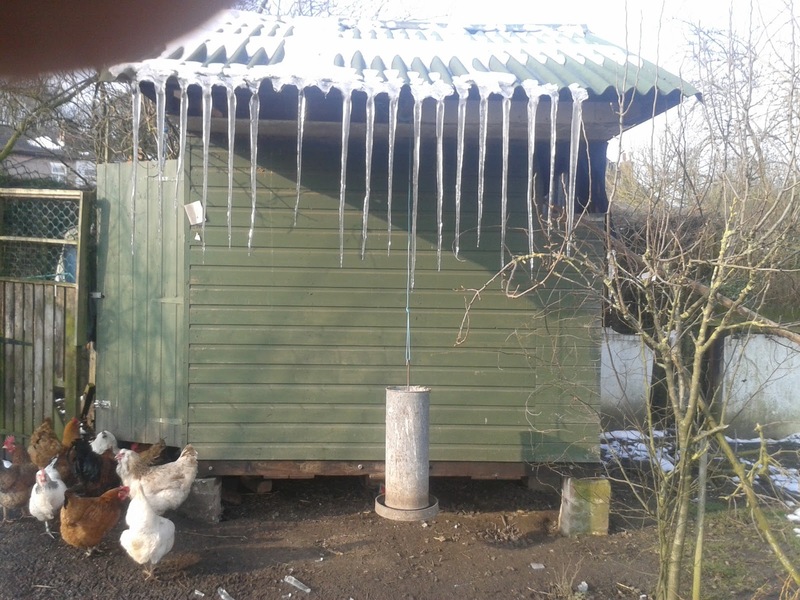 just look at those icicles. D. is really pleased that he built it with that overhang as the hens can shelter there and the outside food hopper can be kept dry. it also allows for some essential dust bathing underneath. I've a really busy week coming up. Hope everybody had a great Easter.